CES 2018: Acer launches the new Swift 7 (SF714-51T), World's thinnest laptop. Acer today launches the world's thinnest laptop, the new Swift 7 (SF714-51T). At just 8.98 mm thin, the new Acer Swift 7 (SF714-51T) stakes its claim as the world's thinnest laptop. The new Swift 7 is an always-connected PC running Windows 10 that's designed for mobility, with an ultraportable design packing a powerful Intel Core i7 processor, all-day battery life and a personal, trusted 4G LTE connection. 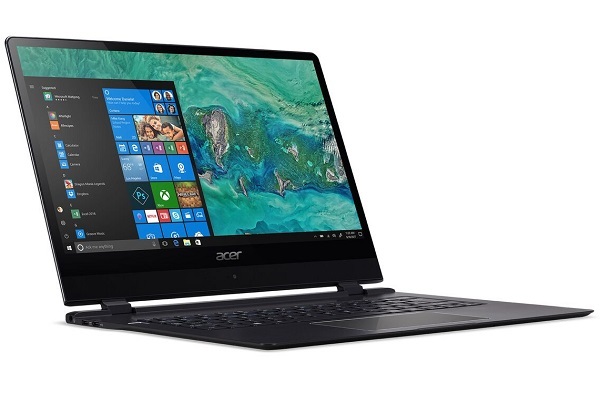 The Acer Swift 7 comes with built-in Intel XMM 4G LTE connectivity that keeps users productive and always-connected. In addition to a Nano SIM card slot, the Swift 7 features eSIM technology, allowing download and activation of eSIM profiles. The Swift 7 ships with a Transatel profile provisioned with up to 1 GB of free data valid for one month in 48 countries to help users get started immediately, while additional data plans can be easily purchased as needed through the Mobile Plans application while travelling around the world. 802.11ac wireless with 2x2 MIMO provides reliable and fast connections to the office or home network. Powered by a 7th Gen Intel Core i7 processor, the Swift 7 provides incredible performance, a seamless Windows 10 experience and up to 10 hours of battery life. 256 GB of PCIe SSD storage offers plenty of room to keep important files at the user's fingertips, while 8 GB of LPDDR3 memory keeps multitasking smooth and responsive. A fingerprint reader allows password-free and more secure sign-in through Windows Hello. The Swift 7's unibody aluminum chassis is perfect for modern professionals seeking a sophisticated look. Its new high-resolution display has been upgraded to 14-inches, and sports a Full HD IPS display, Acer Color Intelligence for lifelike clarity at every angle, as well as a Corning Gorilla Glass NBT touchscreen and touchpad. Typing has never been easier thanks to the Swift 7's backlit keyboard, which is handy in low-light conditions such as long-haul international flights or train journeys. The Acer Swift 7 will be available in North America in March with prices starting at US$1,699; and in EMEA in April with prices starting at EUR1,699.